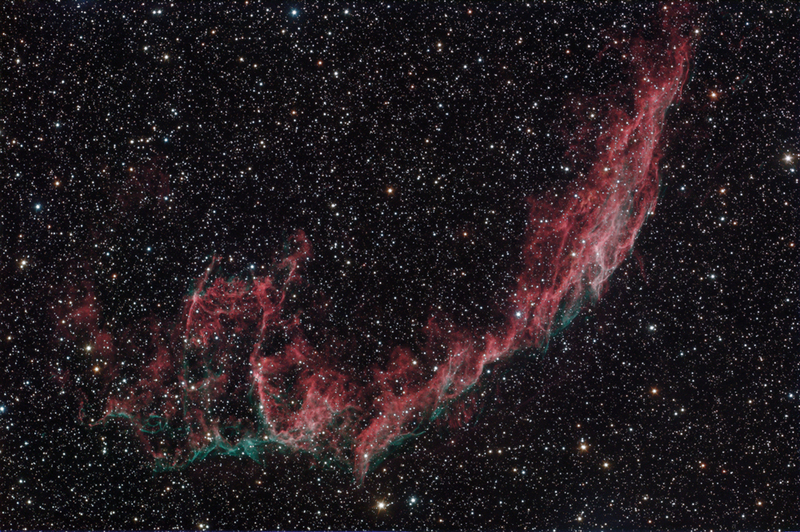 The Veil Nebula, is part of the Cygnus Loop W7radio source 8, or Sharpless 103. Other parts of the loop include the 'Eastern Veil', the 'Western Veil' or 'Witch's Broom Nebula', and Pickering's Triangular Wisp. It is a large, relatively faint supermova remnant in the constellation Cygnus. The brighter segments of the nebula are listed in the New General Catalog under the designations NGC 6960, 6979, 6992, and 6995. The easiest segment to find is 6960, which runs through the naked eye star 52 Cygni. NGC 6979 - the central portion of the Veil Complex is Pickering's Wedge, or Pickering's Triangular Wisp. The processing technique with the synthetical luminance permitted much better control of background noise and color.